Allah Says (what means): "This day I have perfected for you your religion and completed My favour upon you and have approved for you Islam as a religion." Our religion is supreme, it is the most perfect one. It combines the good of this life and the Hereafter; it addressed the soul and was not heedless of the body; it gave preference to the Hereafter but did not neglect our needs in this life. Allah Says (what means): "But seek, through that which Allah has given you, the home of the Hereafter." Allah Says (what means): "Thus We have made you a median (i.e. just) community that you will be witnesses over the people and the Messenger will be a witness over you." How is it that the believers can squander this position, which Allah granted them and become humiliated while they still have the Qur`an and the Sunnah to refer to? Why would we be pleased with becoming mere followers after enjoying the position of leadership ? How can we go astray and become blind-imitators after being guides ? What possesses a person to become a slave who carries out orders, after being a master? The answer to these questions lies in the saying of the Prophet sallallaahu alaihi wa sallam as narrated by Abu Sa'eed Al-Khudri : "You will follow in the footsteps of those who came before you hand-span by hand-span and (the length of an) arm by arm, such that even if they enter into the dwelling place of a lizard you would still follow them." The Companions asked: "O Messenger of Allah, do you mean (by 'those who came before you') the Jews and the Christians?" He sallallaahu alaihi wa sallam replied: "Who else ?" Allah exposed this tactic in His Book when He says regarding the deception of Satan of our father Aadam and our mother Hawwaa' (what means): "And he swore (by Allah) to them both: 'Indeed, I am to you from among the sincere advisors'"
Beware of the deceiver who approaches you with an advising tongue, for he knows that if he were to openly state his intention, he would never attain his objectives. Allah Says (what means): "But they plan, and Allah plans. And Allah is the best of planners." In fact, even if this holiday was invented by the Muslims it would still be unlawful to celebrate it. Aaishah narrated that the Prophet sallallaahu alaihi wa sallam said: "He who innovates something in our matter (i.e. the religion of Islam), will have it rejected." Allah warned us from following the disbelievers or supporting them and commanded us to differ from them. He Almighty Says (what means): "O you who have believed! Take not those who have taken your religion in ridicule and amusement among the ones who were given the Scripture before you nor the disbelievers as allies. And fear Allah if you should (truly) be believers." The Prophet sallallaahu alaihi wa sallam said: "He who resembles a group of people will be with them (in the Hereafter)." 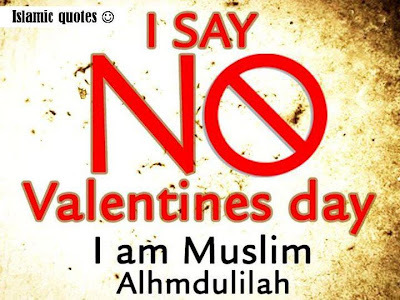 How can it be that a Muslim accepts for himself and his family the celebration of an immoral holiday innovated by disbelievers; Valentines Day, the claimed celebration of love? How can he allow his family to celebrate the holiday of a Christian priest, Valentine, who was cursing Allah day and night by saying: "He is one of three, He had a wife, He had begotten a son etc." ? Allah is exalted far above what they attribute to Him. Allah Says (what means): "And they say: 'The Most Merciful (Allaah) has taken (for Himself) a son. You have done an atrocious thing. The heavens almost rupture therefrom and the earth splits open and the mountains collapse in devastation. That they attribute to the Most Merciful a son. And it is not appropriate for the Most Merciful that He should take a son. There is no one in the heavens and earth but that he comes to the Most Merciful as a servant. He has enumerated them and counted them a (full) counting. And all of them are coming to Him on the Day of resurrection alone." Allah Says (what means): "Be not deceived by the (uninhibited) movement of the disbelievers throughout the land, (It is but) a small enjoyment; then their (final) refuge is Hell, and wretched is the resting place!" Do not be deceived by them and what they doing because this life is a temporary one and it is vanishing fast. Allah Says (what means): "But the Hereafter is better and more lasting"
and also: "It will be, on the Day they see it, as though they had not remained (in the world) except for an afternoon or a morning thereof."